In a historic hearing appearance today before two House subcommittees, former Vice President Al Gore urged Congress to immediately freeze U.S. greenhouse gas emissions and reduce them 90 percent by mid-century. Gore also called on lawmakers to tax the carbon content of fuels as a way to put the global warming issue before Americans. 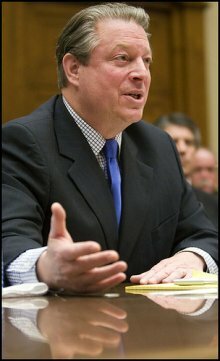 "I fully understand that this is considered politically impossible, but part of our challenge is to expand the limits of what is possible,"
Gore also suggested that the United States push for the next global warming treaty to begin in 2010, two years before the expiration of the Kyoto Protocol. By using 2010 as a start point for the next treaty, the next U.S. president could "use his political chits" to get the country in an "all-out sprint" to reduce its own emissions. Congress should also set up a "carbon neutral" federal mortgage company to support "green" homes, ban sales of incandescent light bulbs and impose a moratorium on new coal-fired power plants built without the technology to capture and sequester carbon dioxide. watch the testimony of the Tennessee Democrat. In a 40-minute opening statement, Gore described what he said is a budding political movement for new climate change policies. He presented 516,000 online signatures he had gathered on his Web site and touted 100 new contacts per second in the last few days since soliciting comments in anticipation of his House testimony. "This is building, and it’s building in both parties," Gore said. Small world dept: Not so many years ago, geophysicist grad student Kevin Vranes and I were part of an intrepid band of New Yorkers marking sites where pedestrians and cyclists were run over by car drivers, as part of a campaign against vehicular dominance of the streets. Now we’re both in the thick (?) of the climate debate. Kevin has published a terrific account of reactions to Gore’s testimony today before the Senate Environment & Public Works Committee, in the Colorado University Science blog Prometheus. Note particularly his recitation of the keen interest in carbon pricing and taxing shown by Montana Democrat Max Baucus and New York Democrat Hillary Clinton. My one correction to Kevin’s valuable report: Keivn, this may have been the first time you heard Gore urge a tax on carbon emissions, but the former V-P has been calling for a carbon tax (with a tax-shift out of payroll taxes) for some time. See details here.